Crooked House (film, 2017). A British mystery film with "PG-13" rating by Sony Pictures. Directed by Gilles Paquet-Brenner. Official Trailer. Crooked House is a British mystery film directed by Gilles Paquet-Brenner. 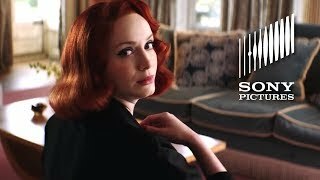 Crooked House - Official Trailer. The granddaughter of late Greek-British business tycoon Aristide Leonides, Sophia Leonides, visits private investigator Charles Hayward in his office. Sophia wants Charles to investigate Aristide's death, for she believes he was murdered by a member of his sprawling and idiosyncratic family. Sophia notes that Aristide' regular insulin injection had been laced with eserine from his eye drops, causing a fatal heart attack. Sophia believes this was deliberate, not accidental. Charles reluctantly takes on the case, in part because he had a brief love affair with Sophia in Cairo. Charles seeks the consent of Chief Inspector Taverner of Scotland Yard to look into the case, utilising his personal connection with Taverner, who had served with Charles's father, a decorated former Assistant Commissioner who was murdered. At the Leonides estate, Charles interviews the various members of the family, finding motives for each of them. All of them get substantial bequests from Aristide's estate. All of them knew about the eserine: Aristide talked about how it could be used to kill him. All of them resented the way he bullied and manipulated them. Lady Edith de Haviland was the sister of Aristide's late first wife; she moved in to care for her motherless nephews. She despised her brother-in-law as a parvenu and for his callousness towards his grandchildren. Edith stalks around the grounds, blasting moles in the lawn with a shotgun. Aristide's elder son, Philip, hated his father for passing him over as successor to the family business, and for refusing to fund production of a screenplay Philip wrote for his wife, Magda, a fading theatre actress. Principal photography began in September 2016. The film Crooked House was scheduled to be released by Sony Pictures on October 31, 2017 (Italy) and on November 29, 2018 (Germany). The duration of the film is 115 minutes. The film's budget is $10 million. Crooked House got average rating from critics. But the audience likes the film.